Published: March 31, 2015 at 11:36 a.m. 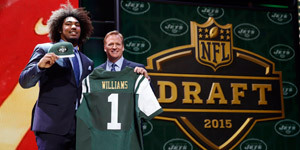 Updated: March 31, 2015 at 12:07 p.m.
Mike Tannenbaum has been so busy since joining the Dolphins he can joke about not knowing what the weather is like in Miami. "When I started, free agency was right around the corner, so it hasn't exactly been quiet," Tannenbaum told the Boston Globe's Ben Volin last week at the NFL Annual Meeting. "People say, 'How's the weather?' I just know where the Renaissance (hotel) is and our office is and where the Starbucks is, and that's about it." Tannenbaum is the face of the Dolphins' makeover -- leaving some to wonder what exactly general manager Dennis Hickey does with his days -- that includes the massive signing of Ndamukong Suh, swiping tight end Jordan Cameron, adding Brice McCain at corner, re-signing his backup quarterback and releasing a bevy of high-priced veterans from the previous administration. However, the Dolphins executive vice president of football operations knows winning the offseason is a fruitless prize if it doesn't produce wins in January. "Look, it really doesn't mean anything sitting here in March," he said. "What's important is what it looks like on opening day and every week. (The New England Patriots are) going to look different come the regular season like we are, so we've got a long, long way to go." The Dolphins' key move -- adding Suh -- was clearly done with the Super Bowl champs in mind. "We were extremely opportunistic on Suh. I think he's going to bring so much to our table that you can't even quantify," Tannenbaum said. "Can we make the pocket dirty for Tom Brady? Those are constantly the questions you have to ask yourself. Look, the Patriots are the defending division, conference, and world champs, and it starts with them. The Bills and Jets aren't sitting still, either. So, we have a lot to do." The AFC East has been the most active and entertaining division this offseason, but for all the turnover the only thing that matters is winning. In the end, the Patriots haven't lost Brady or Bill Belichick.